Healthy food systems are the foundation for healthy lives, communities, economies and ecosystems. In order to build a future for Melbourne in which we can all thrive, we need a food system that is healthy, sustainable, resilient and fair. A thriving local food economy is not only good for business, it’s also good for people and planet. 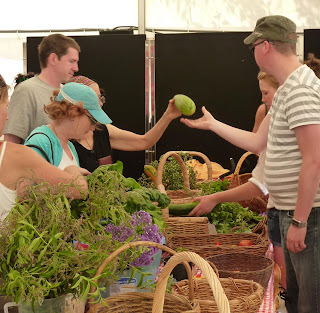 Growing, exchanging, eating and sharing local food connects local people to each other, to their health and wellbeing and the land, creating shared value financially, socially and environmentally. We believe that connected networks of thriving local food systems not only provides a solid foundation for Melbourne’s future, but also for the future of all Australians. Doing Something Good (DSG) are working with City of Melbourne, the Food Alliance and Open Food Network to support the development of individuals, communities and organisations working toward a thriving local food economy for Melbourne and it’s surrounds. Over the last year DSG have been running a series of events as a program for those interested in making a better food future. We’ve designed this Local Food Launchpad program as a platform for building shared understanding of key issues, challenges and opportunities, and to grow our collective capability to work together and make change. Following on from the EcoCity Food Forum in 2013, the Going Local Forum in February, and the Big Ideas Jam in June, we are very pleased to announce that we will be running a series of Concept Development Labs in February and March 2015 to develop concepts for campaigns, products, services, events, programs and other initiatives that will contribute to a thriving local food economy for Melbourne. JOIN US FOR THE FIRST CONCEPT DEVELOPMENT LAB TUESDAY 24 FEBRUARY. increasing the opportunities for city residents and visitors to purchase local and regionally-produced food? If so, we invite you to join us for this series of Concept Development Labs starting on Tuesday 24 February. We invite growers, entrepreneurs, not-for-profit organisations, food retailers, social enterprises, distributors, design and technology professionals, schools, cafés, restaurants and catering services, and other passionate and innovative community members that have a big idea for a better food system or would like to help make somebody else’s idea happen. Over the first five weeks we will work with you to complete a Business Model Canvas, grow your understanding of key issues, challenges and opportunities, and learn and apply the principles of design thinking, Lean Startup, strategic communications and community building to shape good ideas. You will also be provided with tools, templates and information resources to help you develop your local food concept, or any other project you may be working on now or in the future. 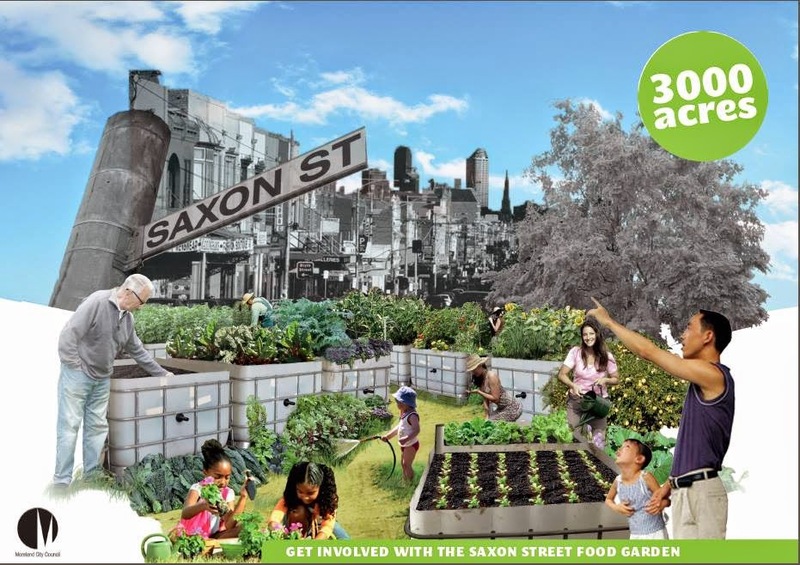 We are super excited to say the Saxon st Garden has now been built, and all community members are invited to the launch and planting party this Thursday from 5:30pm. 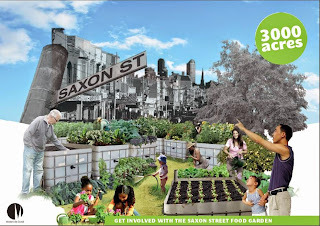 This latest garden by 3000acres, in collaboration with the Moreland City Council, is a new shared community hub and food garden at 33 Saxon Street, Brunswick. On the site of a now vacant primary school, 30 wicking beds were constructed last weekend from repurposed industrial plastic containers with the help of over a dozen local volunteers, and are now ready and waiting for planting. We have a good bunch of donated seedlings from some generous local providers, but as we have 30 beds to fill we are still searching for more, so any excess seedlings that community members may have to contribute will be so very appreciated. The garden will be properly launched this Thursday December 4th from 5:30pm. 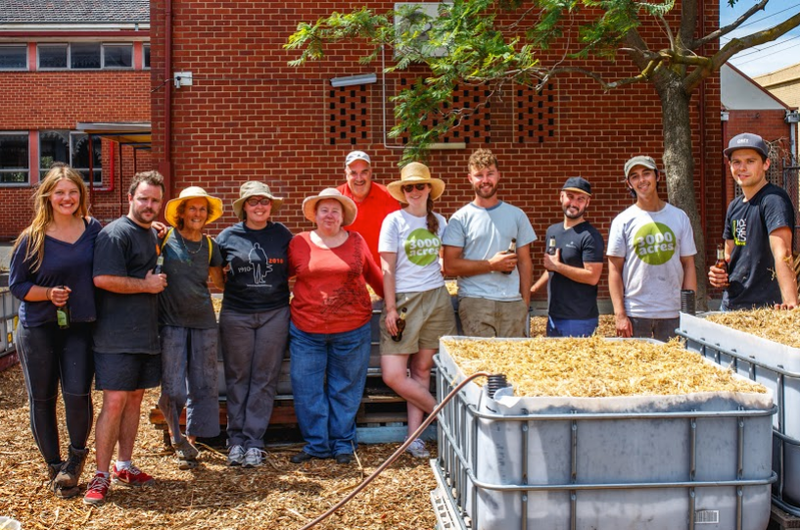 There will be a BBQ, cider from our friends at Faire Ferments Cider Co-op, and an opportunity for people to get their hands dirty and help plant out the garden beds. All are welcome to come and celebrate this great new edible space in Brunswick. 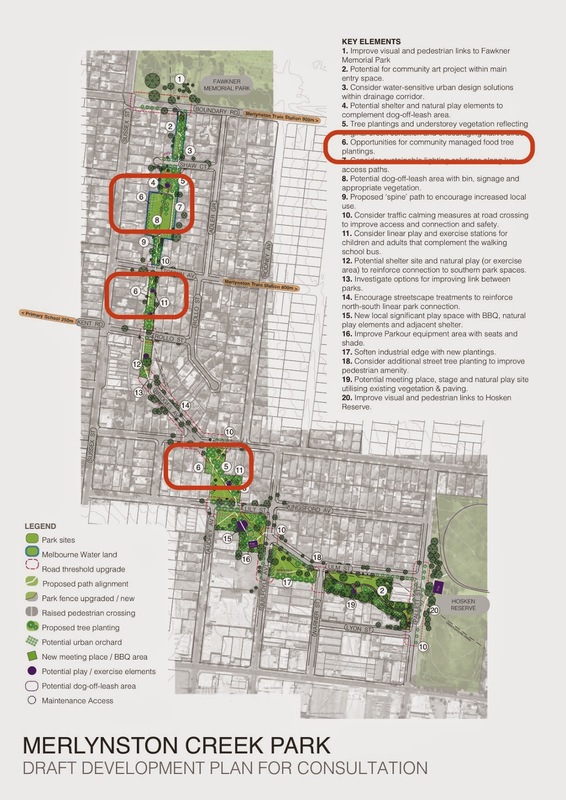 Hidden in the Merlynston Creek Park Draft Development Plan, (currently in the final stages of community consultation until December 5th - more on this below) is a tiny, beautiful glimmer of the future. On their plan map they have three areas marked as "Opportunities for community food tree plantings"
According to the council's FAQ document, "There have been requests for some type of community gardening activity in this area. Given the narrowness of the open space and the number of private gardens in the area Council is suggesting that community orchards could be included in this space. They will be un-fenced and open to all the community. Council will only put in the orchards where the community in the general vicinity are interested in caring for the trees. Council will develop an agreement with a community group who are incorporated or who are auspiced by another organisation so that there is an ongoing commitment to provide this opportunity. Issues of pest management, fruit drop and pruning will need to be managed by the community." Moreland Council are to be congratulated for this. It's a big step for them and an acknowledgment of the increasing demands of their constituents for opportunities to grow food in the community. write to Moreland City Council, 7-9 Walter Street, Hadfield 3046. It's possible that the community was hoping for a more traditional community garden but if that can't be achieved this is a terrific alternative. Imagine strolling along this linear park grabbing an apple or a plum, harvesting olives, feasting on loquats. 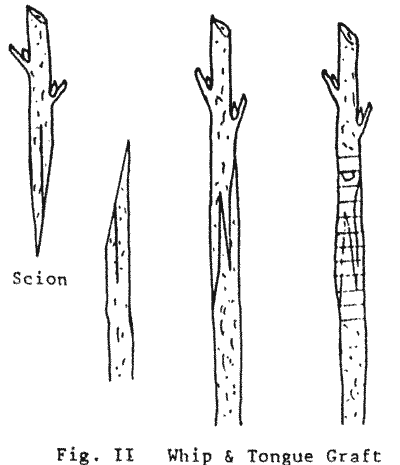 Consider the annual opportunity to teach about pruning fruit trees. In nearby West Brunswick a community managed orchard (well this one's called a food forest) with around 30 mature trees has been growing for more than 15 years. It's a fantastic way for the community to get together, to provide free, fresh food for the community and to teach people how to care for productive trees. Dealing with the pests, fruit drop and pruning aren't a problem. One's just been started in Northcote. In London the folks at the Urban Orchards Project "partner with local authorities, residents’ associations, Transition initiatives, park user groups, schools and other community groups to help design, plant and maintain community orchards in the nation's parks, housing estates, schools and universities." They're full of good ideas about how to do this. The Merlynston Creek Park Draft Development Plan and Playspace Concept Plans are available for comment until 5 December 2014. You're invited to a relaxed end of year evening of story sharing, networking, and organic seasonal BBQ food. All in a relaxed back yard, with fire and music (weather permitting)! We'd love to celebrate the amazing work we have all done in sustainable food, together! We hope you can make it! Nick Rose (AFSA / Food Alliance) has just come back from a Churchill fellowship to the US, Toronto and Argentina. He's moved to Melbourne, and is keen to share these stories and help support the fantastic work that's already underway in Melbourne and beyond to transform our food system into one that cares for all of us and our soils, animals and waterways. 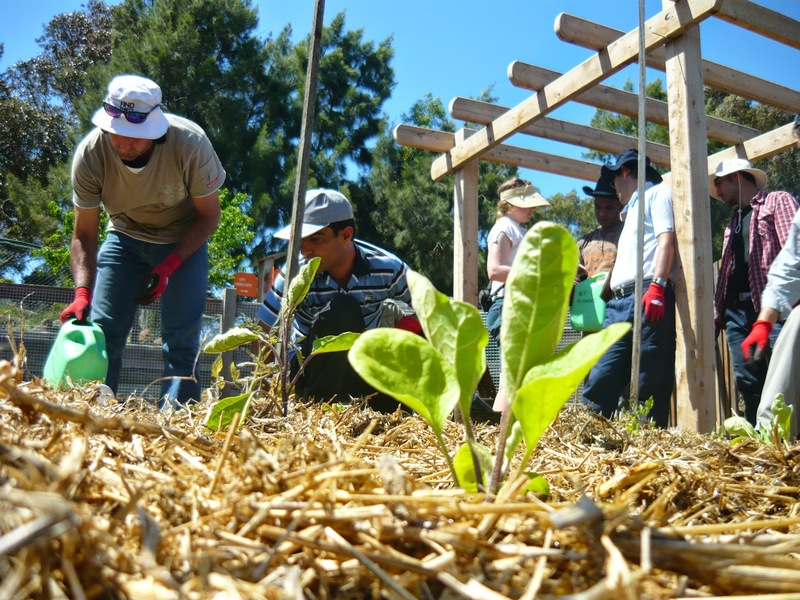 Lets talk about local food systems from across the globe to our own back yards! Drinks at bar prices, profits to Local Organics / AFSA. 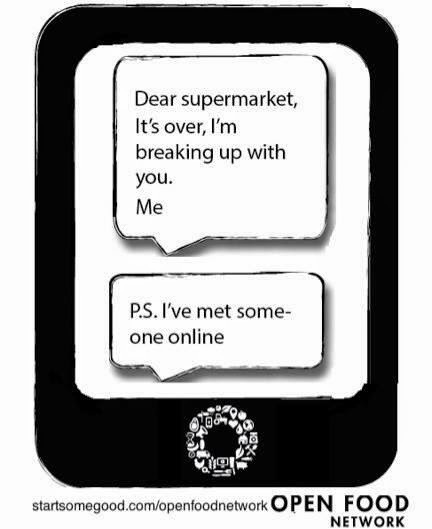 Wish you could be doing more with your waste? Worm farming and composting not only reduces the amount of food waste going to landfill but also provides high quality organic matter and fertiliser which enriches your soil and helps your plants grow big and strong! Come along and learn how to use and maintain a worm farm or compost bin at home and learn too how to make your own worm farm using mostly scrap materials. Learn about why recycling food waste is good for the planet, the many types of worm farms and compost systems available and what works best in certain circumstances. Find out what to feed the worms (and what not to feed them! ); how to harvest and use the worm wee, castings and compost in the garden; how to diagnose and fix problems with your worm farm and compost bin; as well as how to make your own worm farm. Sam Green coordinates a sustainable living program for residents in the Cities of Darebin and Banyule. She is a keen composter and worm farmer. 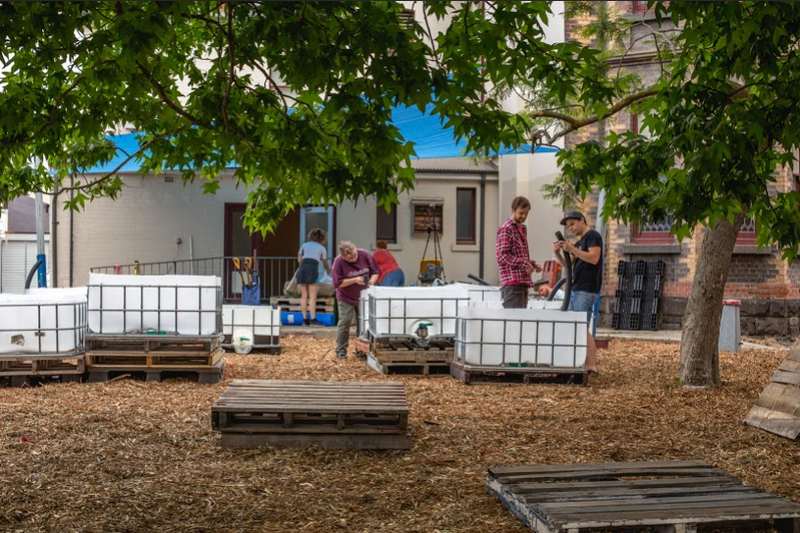 Sam practises what she teaches having established a community composting and worm farming hub in her front yard for which she recently won a City of Yarra Sustainability Award. 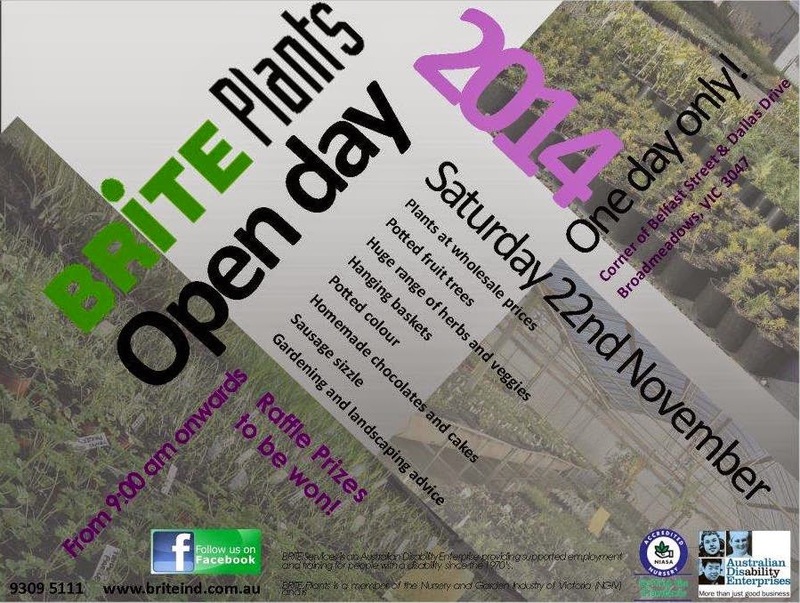 The Brite Plants Open Day is a great day when our wholesale nursery is open to the public. 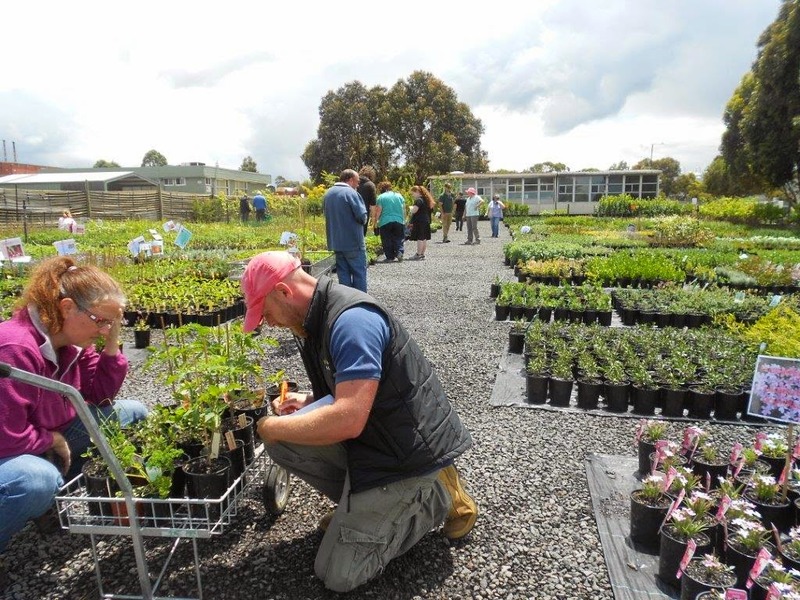 is the wholesale nursery division of Brite Services, an Australian Disability Enterprise that provides employment and training for people with disabilities. has a reputation for supplying quality plants of all sizes to a diverse range of clients within the horticultural trade industry. If you represent a retail nursery, wholesale nursery, Council, or you are a landscaper, builder or an architect, why not give us a call? Proof of trade will be required to ensure wholesale prices. Please contact one of our friendly staff if you are interested in receiving our Monthly Specials List by mail, fax or email or would just like more information about Brite Plants. It's crunch time - one week to go before our Rewiring the food system campaign ends. One more week to buy the new software that will give more people access to Fair Food and by doing so will give more farmers fair prices, give more asylum seekers jobs and fund more education programs at CERES. 180 people have given $17,500, so it's only $7,500 to get to our tipping point of $25,000 to make it happen. The scary thing is that If we don't make the tipping point all donations are returned and we're back to scratch. Rewiring our website is crucial because it solves the problems you, our customers, have shared with us about your shopping experience with Fair Food. It's the project that gives you the power to swap items out of your set fruit & veggie boxes that you don't like and don't use for the things you do want. It gives you the power to have delivery the day after you order, to be able to shop by recipe and lots more. It's the project that will make buying Fair Food doable for so many more of the 300 people a month who try Fair Food and leave because we just don't fit with each other's ways of doing things. And most importantly it's reclaiming all the lost opportunities to build a better food system that those people represent. Asking you to help fund this project is a peculiarly democratic way of doing things. Because now the decision is in your hands; you have the chance to help shape your food system and like the Onceler says in The Lorax, "Nothing will change unless someone like you cares a whole awful lot, nothing is going to get better. It's not." So, if you believe that farmers and grocery makers shouldn't be forced to the bread-line by Coles and Woolworths. If you believe that asylum seekers shouldn't treated as "illegals" but welcomed as human beings who can contribute to to our community. If you believe that people can help build community by something as simple as sharing their verandahs for others to pick up their groceries from. If you believe that the profits from your grocery shopping should help teach children to care for their environment. And if you believe that ethical, fair food should be available and easy to buy for as many people in Melbourne as possible. Then it's time to put your money where your mouth is - literally. This is our last week to get over that $25,000 finish line and do this. Let's make it happen together. I know many will come just to experience the beautiful surroundings and to chat to our gardeners (there is no charge for this incidentally) but we have an amazing array of things for you to browse through and buy. All money goes towards helping our garden to grow. This is a big deal for us so we would love your support. What: There is so much stuff but here is a little selection: a fish tank, jewellery, books, quality CDs (not your normal Op shop rubbish), plants, seedlings, a big bookshelf, a table, a standard weeping Japanese maple tree, lots of clothes, toys, crockery, a table tamp, glasses, shoes, ornaments, a compost bin and more. Unlike all the 'home' garage sales your money is not going into someone's pocket, it'll help our garden to keep growing. Just makes you want to get your wallet out right now doesn't it? Well you'll have to wait but get in early so you don't miss out. Sorry but this event has been cancelled. Presented by Darebin City Council in partnership with Darebin Ethnic Communities, the Backyard Harvest Festival runs from 9 - 23 November in a celebration of home food-growing traditions from around the world. This is your chance to tour over 16 impressive home gardens around Darebin and participate in 7 great workshops, covering everything from chicken keeping, fruit tree selection and care, composting to aquaponics. Plenty more info here. 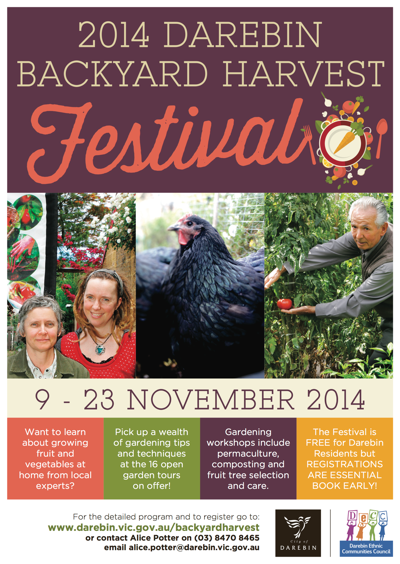 Darebin's Backyard Harvest Festival is FREE for Darebin residents and only $10 per event for Non-Darebin residents. REGISTRATIONS ARE ESSENTIAL as numbers are limited so BOOK EARLY! There is a 4 event limit per person. Home garden locations are provided at the time of booking. 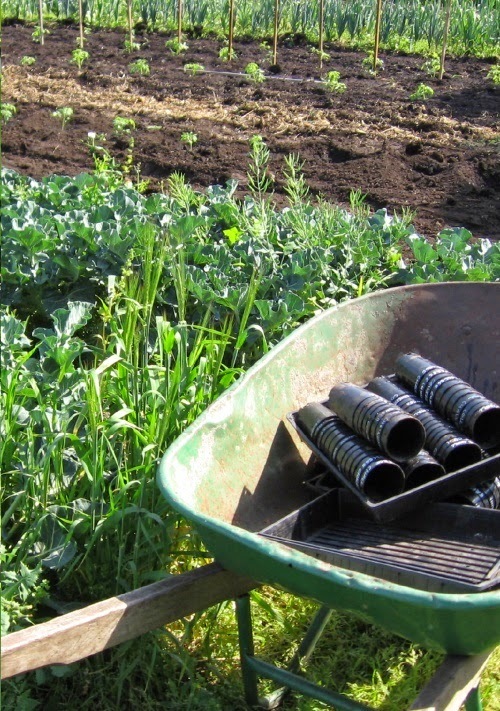 If you want to know more about organic gardening but don’t know where to start than this course is for you. Join CERES Trainer, Justin Calverley as he introduces you to the basics of horticulture, permaculture and organic gardening. This course will provide you with the skills and knowledge to confidently propagate seedlings, save seeds, grow vegetables and more! ￼In 2014, the Royal Botanic Gardens presents an expanded Professional Development Program featuring some of Australia’s and the world’s leading experts in nature-based education. The Royal Botanic Gardens in partnership with the Catholic Education Office Melbourne will present sessions on; the cross curricula priority of Aboriginal and Torres Strait Islanders people in the AusVELS and Indigenous culture. Would you like us to visit your school or early learning centre? We offer consultation on how to enhance your outdoor play spaces or we can deliver a range of workshops utilising your outdoor areas. Please call RBG Melbourne to discuss how we can tailor to your individual needs. Its October and Spring has truly Sprung with its wild and unpredictable nature, pretty much in step with Melbourne's reputation for four seasons in one day. 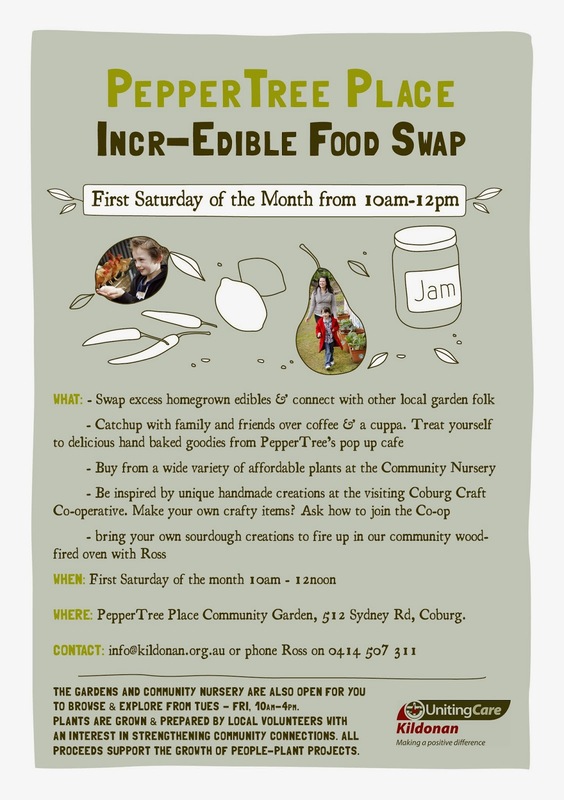 PepperTree Place hosts the October Incr-Edible Food Swap on Saturday 4th October, 10am-12pm and the place will be buzzing this month! Not only will there be the bountiful amount of free, swappable, fresh produce that pours in through the gates with the friendly locals but Ross will be wielding sourdough and have the wood oven fired up for his Sourdough Bread Making Workshop starting at 10.30pm. If you've ever wanted to get down and dusty with bread makers, here's your chance to get close up and personal with the living breathing culture that is sourdough. Register at 10.15am for $10 a head. Also this week, Moreland City Council are looking to consult with community about their new Community Food Growing Policy. A Moreland City Council staff and a member from the Moreland Food Gardens Network will be attending the food swap on that Saturday 4 October from 10am–12pm. Everyone is welcome to attend to discuss and share ideas. As is usual for the Coburg Incr-Edible Food Swap Saturday, the nursery is full of beans (bush beans actually) and has a huge variety of affordable plants and products ready for spring planting. We have bales of lucerne, hardwood stakes, bamboo stakes, bags of pulverised sheep manure and bargain bags of primo potting mix also available. The pop up cafe will be serving an array of hand baked goodies and the best coffee and tea this side of the Merri Creek. And just a heads up that our annual Spring Garden Fiesta is just around the corner on the 8th November, 10am-4pm - a huge day of music, inspiring and informative workshops, cool, nature inspired kid's activities, info and displays, story telling and much much more! Share this flyer with your friends and family - its a free event and everyone is welcome!! It's been a tumultuous time for the folks involved with urban ag in Yarra, their funding was being cut and their pioneering urban ag facilitator role was under threat. Thankfully due to a large surge of support, the local community was able to persuade Council to reconsider and the role has been confirmed for a short term. Your help is now needed to further shape Yarra Council's efforts in this area. Take a few minutes to influence the future direction of our city. They need people to answer 7 feedback questions which you can do here. Judging them on their efforts to drop the role mentioned above, it would seem a good idea to make sure what they're planning is on the mark. Go on, find 15 minutes. The offer closes on Friday 26th September. 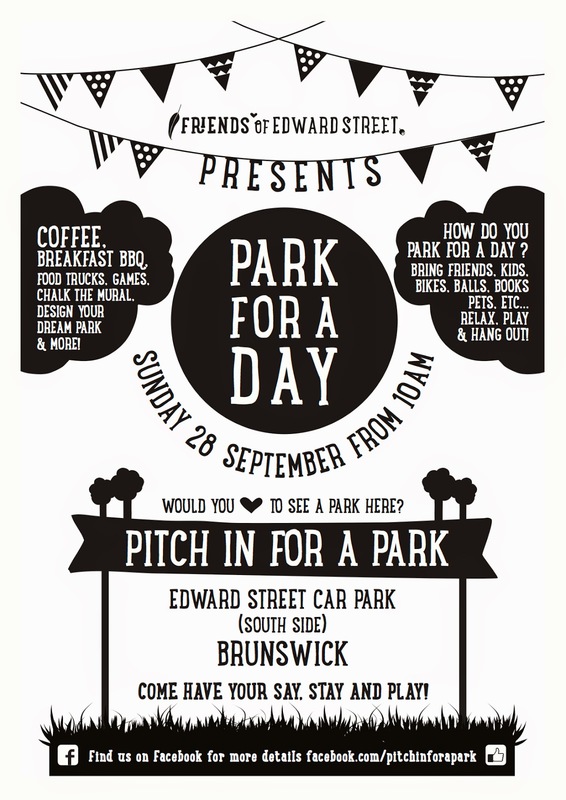 You are warmly invited to PARK FOR A DAY on Sunday 28th of September 10am-4pm at the Edward & Dodds Street Carpark in Brunswick. This pop up park is part of a longer term campaign to have some of this unused carpark converted to a green space for everyone. We want the local community to come along to Park for a Day and show support for this idea and share your ideas about what a park here could look like.... The question for you food gardening fans is....Would it include edibles? Come along and have your say! 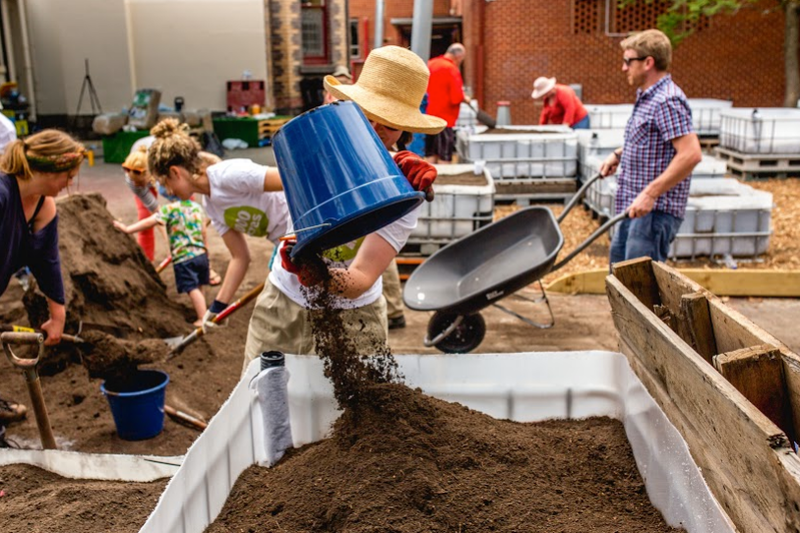 Friends of Edward Street is a local brunswick group commited to greening their local neighbourhood with food plants and habitat and bringing the community together in the process. The group formed 3 years ago when some members got talking about converting some of a unused car park on the street to a permanent park. They decided that by forming a local friends group to become stewards of the Edward st naturestrip outstands they could demonstrate how commited they were to creating and helping to maintain a new park. Since then we have been busy maintaining and creating gardens along the street with the help of Moreland City Council seeding grant and helping to maintain the communities for nature habitat corridor that also runs along the street. Perhaps our most loved achievement along the street is the installation of a childrens garden- frequented and cared for by local children. Spring is definitely in the air (apart from that first day glitch) and time to shrug off the cold and get some spring in your step - best to come down to PepperTree this Saturday with your fresh garden goodness to swap with like minded gardeners. Diana Cotter will be running our first spring garden workshop and sharing some great tips on how to prepare your summer vegie patch. See registration details below. Paul will be here chatting about chooks in Chookville from 11am at no cost. We are also beginning plans and preparation for our annual Garden Fiesta - this years theme is Recycle/Upcycle. Happening on the 8th of November - we are looking for volunteers to help at the event or in the lead up to event preparation - there is lots to do!! Nov 8th: Spring Garden Fiesta!!! 10am-4pm All day extravaganza!! Featuring local music, the bounty of PepperTree nursery, great organic food and drinks, nature inspired kids activities and informative workshops in a family friendly environment. If you came to the recent Permablitz at the West Brunswick Food Forest, you might have been lucky enough to have a pruning tutorial with John Pinniger of the Heritage Fruits Society (a not for profit whose sole purpose is to preserve heritage fruit varieties). 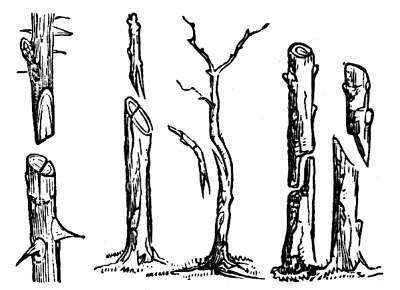 John has just announced he will run a couple of 'masterclasses' in grafting for those Permaculture designers and others who would like to improve their skills - or learn the basics. This will be hands-on. It will involve learning the reasons for, and the science of grafting, and then some practice. Budding will also be discussed, (although Winter is not the best time to do it). Your questions answered. John's a great teacher, very knowledgable and happy to offer explanations. This is a fantastic opportunity to learn from an expert, it won't cost you a dollar and you'll help a very worthy cause. Sessions are planned for 9 AM - 12AM on Thursday 11th September or Sunday 14th September. Where? Location will be Fairfield, accessible by public transport - address sent with acceptance. RSVP: Please book by emailing John at cjpinn@bigpond.net.au with the subject line GRAFTING and your preferred date. For more on the film festival, go here. Almost thirty years ago, the announcement that McDonald’s was setting up shop in the heart of Rome, provoked large numbers of angry demonstrators. But one charismatic Italian chose a different approach — he set about creating an alternative. Meet the ebullient Carlo Petrini, founder of ‘slow food’ — an international anti-fast food resistance movement, that aims to simultaneously preserve local traditions, agricultural diversity and the pleasure principle. In this charming biopic, we celebrate the growth of the slow food movement, from the tiny town of Bra into a revolution, that now has roots in more than 150 countries. Alongside cheese-makers, vintners, and artisanal food folk, we toast Petrini for bringing about a change in consciousness that shook the very foundations of gastronomy. SCREENS WITH: GROWING FOOD PROJECT (Rasha Tayeh, 2013) which explores Melbourne's community food movement and initiatives, where people are coming together to build, local, fair and sustainable food systems. Pause this mid winter at PepperTree Place and take in some tasty hand made treats over coffee and cups of tea at the Pop-up Cafe. Continuing with our Food Garden Workshop Series, Judy Allen will be taking the Composting and Wormfarming workshop from 10.30am this weekend. Register at the Swap Table from 10.15am, $10 per person. Trouble shoot your compost problems and get those worms a kicking in your garden! Peruse our Plant Nursery for affordable plants of great diveristy - natives, vegie seedlings, perennial herbs, climbers, groundcovers and unusual edibles. Ross will have some sourdough creations baking in the woodfired oven. Bring your own to bake and find out about the fine art of wood fired cooking! Ross will be running a work shop on making and baking sourdough bread at the October Swap - so put it in your diary now!! Aug 2nd: Composting and Wormfarming - have all your questions answered! Nov 8th: Spring Garden Fiesta!!! 10am-4pm All day extravaganza!! Featuring local music, nursery, great food and drinks, kids activities, workshops in a family friendly environment. PepperTree Place is Kildonan Uniting Care's Community Hub and Social Enterprise base located in Coburg. We have a volunteer powered community nursery open all week, a pop-up cafe open on the 1st Saturday of the month and at special events, we run informative workshops and are also a composting hub - bring your organic kitchen waste down to feed the worms. PepperTree is open to the public Tuesday - Friday, 10am-4pm and the first Saturday of every month, 10am-12pm. Located at 512 Sydney Road, Coburg. Entrances on Urquhart St and Bell St. Handy to public transport: Tram route 19; Upfield Train line, Coburg Station and a five minute walk. Buses at back gate on Bell St.
Our next MFGN Quarterly Social is fast approaching on Friday 1st August and everyone is welcome. Last social we saw 20+ friendly faces come along to hear about the urban and regional food charter which triggered plenty of interest and enthusiasm (and maybe even some tangible activity in terms of a Moreland council policy). We've picked a Friday this time in case Tuesdays are difficult (it being a school night and all). This time Zainil Zanudin will be our guest to talk about her research project: Urban food production as a strategy for food security in Melbourne, exploring the diversity, abundance and production practices of urban food production within a 70 km radius of the Melbourne CBD. After we hear from Zainil and have an a opportunity to discuss what her research revealed, we’ll mingle, chat and eat. It's informal and everyone is welcome, an opportunity to find likeminded, enthusiastic people all in one place. Wow, Food Forests are THE THING right now. 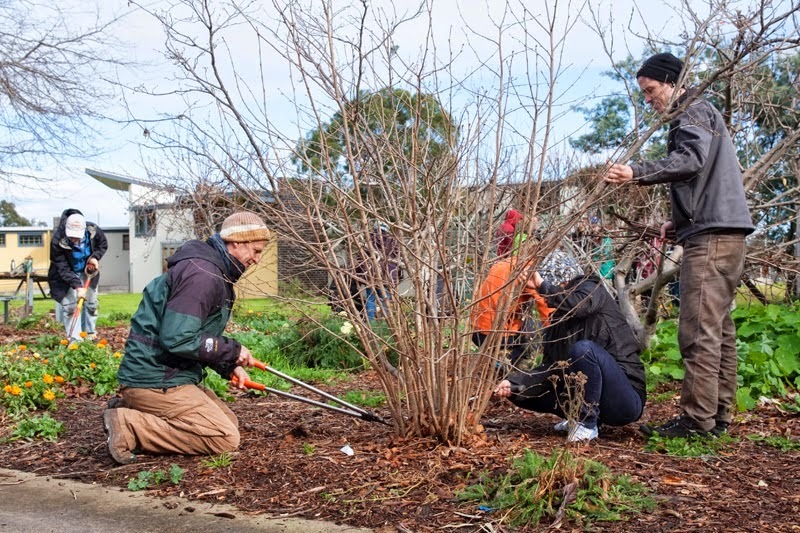 Darebin City Council is building its first food forest based on a design incorporating many of the community’s great ideas and suggestions. You are invited to learn about planting fruit trees and be part of the Food Forest’s creation by helping us plant the forest on National Tree Day. Where: At the site in All Nations Park, on Separation Street, Northcote (opposite Santa Maria College). What to bring: Bring your own water, warm weather-proof clothing, gardening gloves, a hat and a hand trowel if you have one. There will be a limited number of tools available. Bookings not required. Drop in any time during these hours to lend a hand. Free tea and coffee will be provided. Go on, help disrupt our food systems - support the Open Food Network. You'll feel better. The Open Food Network has the potential to really disrupt our food systems - in a good way. Eaters can “know their farmers” (where they are, how they farm, exactly what price they get) while still having wide choice and the ease and convenience of local pick-up and access. Farmers can set their own prices, tell their own stories and choose who they trade with. Ethical and diverse food enterprises ("Food Hubs") rebuild local economies by supporting these farmers and eaters to distribute food. Well, they need you to get on board now and help make it happen by contributing funds to their crowdfunding campaign. Every little bit makes a difference, so even if you can only spare $20, they will absolutely put it to good use to get this platform launched for use by farmers and food hubs in Australia, with the software available for use all around the world! Proudly open source (we mentioned them a little while back in our post about 3 Melbourne-based Open Source, Fair Food Projects) and not for profit, they're creating software with and for the global fair food movement. The Open Food Network, the first project of the Open Food Foundation, is a free and open source project aimed at supporting diverse food enterprises and making it easy to access local and sustainable food. (Saying that, they've been around for a while in other guises. You might even remember reading here about Eaterprises as far back as 2011). Winter is a special time of year for the garden where we slow down a tad, take stock of the garden, make some leaf mould, keep the compost turning and prepare the soil with organic matter and green manures. Some people stop gardening all together thinking nothing grows during these colder months, but we can assure you that winter vegetables and fruits continue to grow and thrive here in Melbourne right through the frosty months!! Last June, the Incr-Edible Coburg Food Swap Table saw a huge diversity of free fresh food being presented - the likes of lemons, kiwifruit, pomegranate, Jerusalem artichokes, bunches of chard, rhubarb, basil, kale, bay leaves, silver beet plus celery, chillies, Warrigal Greens, carrots, Vietnamese mint, plum jam, seedlings, olives, chokos and oranges to name a few!! PepperTree Place is Kildonan Uniting Care's Community Hub and Social Enterprise base located in Coburg. We have a volunteer powered community nursery open all week, a pop-up cafe open on the 1st Saturday of the month and at special events and we are also a composting hub - bring your organic kitchen waste down to feed the worms. PepperTree is open to the public Tuesday - Friday, 10am-4pm (but won't be open Tuesdays in July for 2014 only). Mixed Dozen are running a playful new community meal making program, and you might be interested. At Mixed Dozen, we believe that there is need to reinvigorate the local, to rediscover our sense of community. How do we do this? Through meeting the people in your community you would never talk to otherwise, and what better way to connect with people than through food? This meal gives neighbours the space to play, create, give and make better connections to the people around them. There are six $500 grants for those in the Melbourne and Geelong regions wishing to create a playful, community meal event. Individuals or organisations can apply at mixeddozen.net/md-grants. But don't be too slow, applications are closing on the 31st of July. Mixed Dozen is run in association with the Uniting Church, CERES Fair Food, Foodie Feasts and Project Synthesis. These organisations have all joined forces in their common love of binding communities together, and eating local and sustainable produce. It would mean a lot to us if you could share this within your networks, through word or mouth or even in your newsletter or similar.